I awoke to a frosty morning. Looking through my kitchen window, I could see that my garden had a light coating of snow, dusting the few trees and bushes in my back garden. The stone paths and wooden furniture had a patina of sparkling frost that shimmered in the early light. "It'll be mud by noon. "; I thought to myself prosaically and turned my mind to the more pressing of the day's engagements. "What should I bake today?" The gentle frost and muted colours of my garden made me think of a beautiful photograph by Jonathan Lovekin in Nigel Slater's Kitchen Diaries II, for almond, marzipan and berry cakes. The recipe is on page 44 and the photograph on the facing page of Kitchen Diaries II. The recipe itself came about after one of Nigel's trips to Norway, where he was able to immerse himself in the fashionable new bakeries of Oslo. I remember seeing the recipe a couple of years ago in his Guardian column and made a mental note to bake it and then promptly forgot. The photograph was a lovely call-to-action. I had to make a few very minor changes to the original recipe. Firstly, I made a traybake rather than individual cakes and then cut the cake into squares. Secondly, my cake batter was extremely stiff. (I used medium rather than large eggs.) I added a small splash of milk to loosen the mix a little. Lastly, the original recipe used 200 grammes of mixed berries, including blueberries and red currants. I only had 100 grammes of blueberries and the house was bereft of any other fresh fruit. This lazy cook's solution was to use half a jar of last year's plum jam, combined with the blueberries to top the cake. The cake was probably a little stickier than Nigel's version, but gorgeous nonetheless. Blueberries and plums work well with the almond flavours. Do let the cake cool completely as I think it improves the flavour and then you can really taste the almonds. The proof is in the pudding, so it is said. For me a sign of a successful bake is by the crumbs in the empty cake tin and the hopeful plea for more. 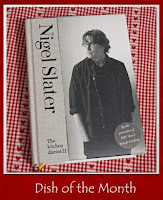 Since this is a Nigel Slater recipe, I am entering into Janice at Farmsgirl Kitchen Nigel Slater Dish of the Month challenge, , jointly hosted by Sue at A Little Bit of Heaven on a Plate. Janice and Sue are challenging you to cook a Nigel Slater recipe every month. It will be my pleasure! It is the perfect balance of almonds and marzipan. I suspect it would be lovely with raspberries too. Gorgeous photo! I can't sleep due to jet-lag and I've been lying here reading the book. I just got to page 44 and something compelled me to browse my favourite food blogs and here I am! It's like 3D cookery reading! These remind me of the type of cakes I used to get in a bakery in Germany when I lived there about 15 years ago. They look lovely. Dom - nice to see you back after your American adventures! Thank you so much for the compliment, it makes my day! I suspect the new Kitchen Diaries is going to become another classic - quite rightly too! Corina - they are delicious. I shall definitely be making them again - I suspect it's the little bit of chopped marzipan that makes all the difference! 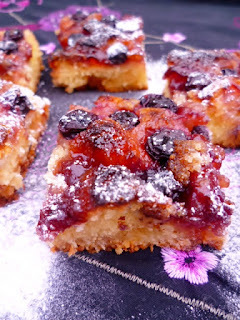 I made these just after Christmas and they were lovely, and I 'nearly' made them as a tray bake too...yours look delicious and many thanks for joining in. 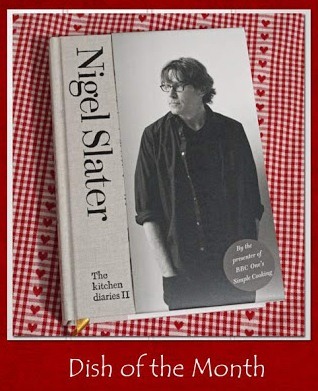 Nigel Slater's recipes are some of the best. HOORAY! I can finally post a comment! I am so sorry Rachel, I have tried to leave comments here for a week, but was unable too, and now I can! I LOVE this recipe, I have had my eye on it too, as Janice had, and as I have berries in the freezer and post-Christmas marzipan, I may make it this weekend! Sue - I am delighted to be taking part. It is such fun! Hamilton - the perfect cake on a snowy day and yes, Nigel Slater is the best! I think it was his writing that got me into food! Karen - is the problem posting something I need to fix my end? Back to the recipe - it really surprised me - I knew it would be good, but it was better than that. But the next time I make it, I won't use blueberries because they really don't have too much flavour ... I'll wait til summer and it will be cherries, raspberries, blackcurrants or blackberries. Or maybe apricots. Or peaches . . . so many choices! Love the sound of the marzipan in there, they look so pretty too studded with berries! But the recipe only called for plain flour. Tgere is no mention of baking powder/soda... I was wondering if this recipe was correct? I do not see any raising agents? Thankyou want to make this today! No you're absolutely right, just plain flour and no rasing agents, apart from the eggs that will give a smidgen of lift. It is actually quite a dense, squidgy cake. One of my favourites! :) I hope you enjoy it as much as I do! There is another official link to the recipe on The Guardian website, if that helps. have I created a new life form in the kitchen?